re: Final Fantasy XV - "The fifteenth coming." Disappointed at the PS4 exclusive thing, but hey, it looks gorgeous and seems to play really well. I'm very interested in the hordes of new characters shown in the trailer. re: Final Fantasy XV - "A world of the Versus epic." I'm liking the new colors for the logo and that trailer was so full of action. The monsters were gigantic. Hopefully they reveal more info about it soon that might point to more of the open-world aspect that they hinted at in the footage from all those years ago. The trailer looked great, but the last thing I want is for XV to be a linear, set-piece-filled action romp. Really want to see more details about the gameplay specifically. Or it could be a massive bomb. High expectations and whatnot. Personally, i know i'm gonna enjoy it. I'm going to finally be able to watch this trailer. It was hard to watch it in class, yelling at people in the chatroom, all the while the stream was freezing. My PS3 is already on the chopping block and I only just got it last year on Black Friday. The "Warp" and "Link Form" really interest me. I wonder what the vertical limits on warp are, or if it is just limited to how many things you can stab your sword in to. Also I love the stylistic choice in making HP deplete from left to right rather than right to left. The weird buildings part really reminded me of DmC with the weird platforming style it had, but obviously XV pulls it off better. I'm going to cry forever because Stella and Noctis knew each other as kids and it was cute. And just...EVERYTHING. I'm hoping that we get the chance to explore the city to its fullest before it gets ruined by the enemy. The guy who is voiced by Keiji Fujiwara with the hat and pretty hair...I like him. And I can't wait to see the green eyes chick. Visual Works, Nomura, and PDD1 essentially got to make another movie without it being a movie. Is this running on Luminous? The one thing I found really interesting was that Roberto Ferrari who worked on The Last Remnant has done character design with Nomura. I've never really seen his work, so I'd like to know just how much he got to do for XV. The FFXV trailer was great, I wish Stella and the twinky-blond boy (What's his name?) had more screen time. I've watched it twice so far, going to watch it again a couple more times tomorrow. I am not okay, and by not okay I mean I'm supes excited. I fell in love with that scenery! I can't wait to explore all these places! Yeah, that's my biggest concern too. I hope they show more of it before E3 is over. Look closely, and you'll see a mini-map pop up on the right-hand side when he warps onto a flying ship. Based on the mini-map, the place looks pretty big and open. Of course, it's far from a guarantee, but at least it confirms that it isn't just "walk forward from point A to point B down a linear path." Also, when will someone post an analysis video, or make a video break-down thread? I already notice a ton of little tidbits from the HUD, and from the video in general. For instance, how the Warp command works differently when the white line isn't appearing next to the Warp Command's diamond. Or how the list of 5 weapons next to the command list confirms that Noctis can switch between all of the promised weapons from the 2006 reveal trailer. 2:39 - Noctis switches to the Spear. Is hanging on the ceiling a unique trait of the Spear? 2:51 - The Command List switches from Warp - Attack to Item - Magic. This implies that similar to KH, you can hold down a shoulder button to swap between different command lists. 2:55 - The scene quickly becoming an iconic part of FF15's game's trailers keeps evolving slightly with each trailer. First it was just Noctis and the young white wizard in 2006; then the subsequent trailer back in 2010-ish showed Noctis' father and the older wizard alone in a room, and now it appears this confrontation is happening during a negotiation of sorts. 3:08 - It appears that the dragon is picking up chunks of the city and swirling them around in its water funnel as it fights Noctis. Pieces collide as marked in 3:19, but it is unclear if these houses and buildings collide at random, or if it is timed by your progress in the boss fight. 1:22 - Multiple airships shed their outer platings to reveal large cannons. This must be the invasion of the opposing nation. 1:26 - One of the clips promising a high quality of characterization and storyline. As described by commenters on websites, this scene is understated and subtle, yet effective in portraying the father's wish to teach Noctis nobility while simultaneously showing his compassion and willingness to relate with Noctis on his own level, a child-like level. 1:45 - The scene of the 2006 reveal trailer has finally been revealed to be the opposing nation's stronghold. The 2006 trailer shows Noctis walking out of said building to confront an army of armor-plated, gun-wielding soldiers. 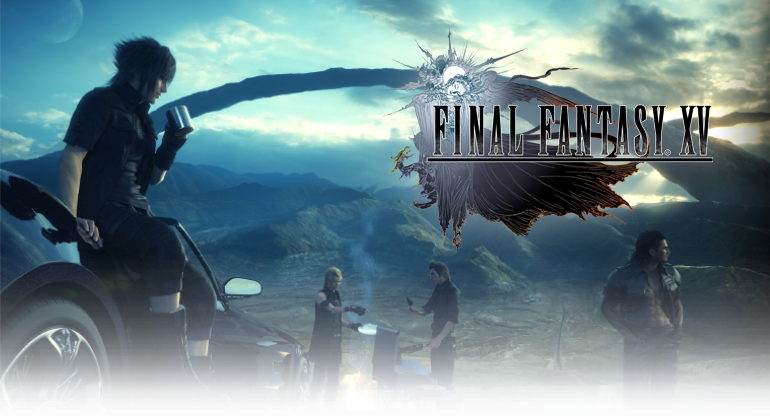 Of course, the storyline could be heavily overhauled after seven long years, but it appears that Noctis will travel to the opposing nation's stronghold sometime in the game. 3:37 - The order of these characters' faces are obviously symbolic. Stella is the child of the head of the opposing nation, an obvious Romeo-Juliet dynamic; the guy with red hair is probably the guy with the hat and umbrella; the the black-haired girl is probably the antagonist with the huge sword shown crashing onto the airship in the 2010 video; The old man with the beard to the left of her looks to be the general walking in front of the soldiers at 2:22; and finally, the young man in the hood appears to be the same character who had the stand-off with Noctis back in the 2006 trailer that later evolved into the negotiation stand-off between Noctis' and Stella's fathers. 1:59 - An apparent kingdom. What confuses me is the earlier 2010 trailer depicting Noctis riding in a car, in what seemed like a city heavily based on roads and car transportation, while this new kingdom seems closer to Venice, heavily based on boat or water transportation. Which city is Noctis' stronghold? Was Noctis in fact invading into enemy territory when the 2010 video depicted him in the Shibuya-like city, hijacking mechs and fighting soldiers? Do the scenes depicting Noctis riding in a car happen during a peaceful era of international relations so that Noctis can travel peacefully? Anyway, these are just some random thoughts that I felt like voicing at 4am so that I could go to bed without these thoughts swimming in my mind, keeping me up. So excited for Final Fantasy 15! It's not confirmed PS4 exclusive though- it might be still coming to Xbox One or even the other generations. it's not coming to xbox one. Where does it say that it's not coming to X1? It doesn't say it's a PS4 exclusive. 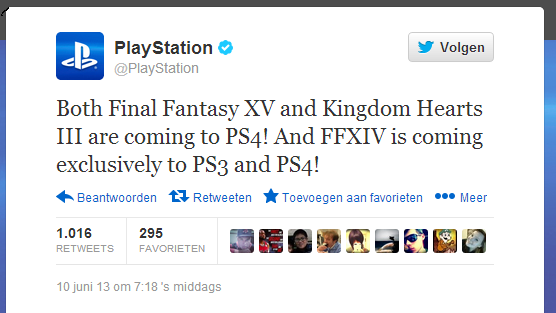 All it says is XV and KH3 are coming to PS4 and that FFXIV is a PS3 and PS4 exclusive. All it says is XV and KH3 are coming to PS4 and that FFXIV is a PS3 and PS4 exclusive. PS4/PS3 exclusive means it's not coming out on Xbox One.